To make a base for cold hibiscus tea, boil water and add to a handful of dried hibiscus flowers in a Mason jar. Once it has cooled to room temperature, strain into a second Mason jar. You can keep the base in the fridge for a pretty long time; at least a week. When you are ready for cold hibiscus tea, put a small amount of the base over ice and add plenty of water or club soda and lemon. 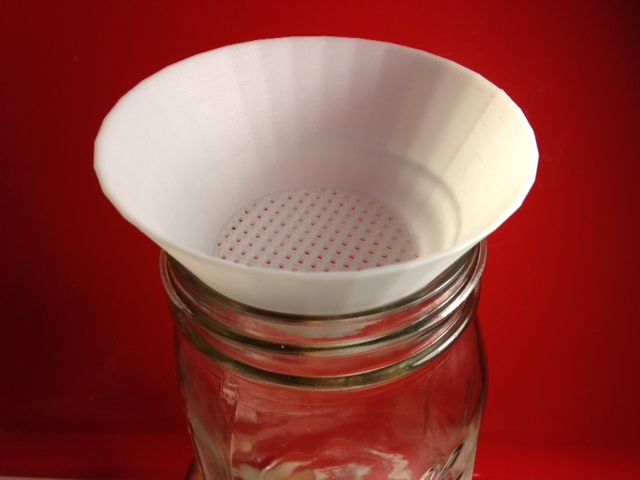 The only tricky part is straining and funneling at the same time when making the base - but not anymore! Settings: Afinia at .4mm resolution, no supports (<10% setting), fast, with raft. Printing takes about 37 minutes. UPDATE: This print was "thing of the week" on the www.3dgeni.us blog. With an action photo!